Maybe it’s Jorge Ramos’ compassionate journalism and piercing blue eyes. Or perhaps it’s Piolin’s lively morning routine. And let’s not forget the captivating novelas. One way or another, there’s a good chance some part of Univision Communications touches your life. After all, the company includes one of the top five networks in the country regardless of language as well as the top Spanish-language website, among other media properties. Of course, the Spanish-language media giant didn’t start at the top. Univision began in 1961 as a single UHF Spanish television station in San Antonio, Texas. Over the years, the company’s ability to nimbly innovate, seize opportunity and find fresh, young talent has left Univision in an enviable position despite the current downturn in advertising. Following a strategic realignment that places a new management team at the helm, the company is adapting to new economic, technological and social realities. Key to the new strategy was expanding offerings across all platforms to better serve the business partners, the local stations and the community. To do that, the two prime areas of focus became entertainment and news. With leading shows like Corazon Salvaje, Hasta Que El Dinero Nos Separe, El Gordo y La Flaca and Sabado Gigante, Univision has occasionally surpassed even general market networks with coveted viewing audiences in hard-earned timed slots. However, much of the programming that draws so many viewers during prime time is supplied by Mexican broadcaster Grupo Televisa—as much as 15 hours worth—and that contract is set to expire by 2017, if it isn’t renewed. Some suggest that the new focus on entertainment and the creation of Univision Studios in late 2009 is part of a plan for Univision to develop its own content and rely less on Televisa. Whether or not this contract is the impetus, it’s not a bad strategy, especially since Univision Studios will serve as a playground for new, cutting-edge programming that may help lead the company into the future. For example, the division will produce and co-produce telenovelas, reality shows, dramatic series, entertainment specials and other programming formats for all of the company’s platforms including its three television networks—Univision, TeleFutura and Galavisión—as well as Univision.com and Univision Móvil. Industry veteran Luis Fernandez, now president of entertainment, was initially named president of Univision Studios, and the launch of the division was the first major initiative under the Univision Networks since 36-year-old Cesar Conde became president in October 2009. This shift also addresses the Univision audience’s evolving tastes. While there likely always will be a treasured place in the Latino heart for novelas, a new generation demands programming that simply isn’t available out of Latin America. “The novela genre is timeless and will continue to be,” Conde says, “but some genres that are tremendously popular here haven’t taken off yet in Latin America. There’s a need and a hunger for this programming, so we developed it as original content.” Case in point: Vidas Cruzadas, the novela made for the web that was such a huge success it is being extended for television. Guiding the company’s news operations is industry veteran Alina Falcon. She has held various positions, including senior and executive vice president and director, at TeleFutura and Univision, and she won a regional Emmy Award while working at WLTV-Miami. In her new role, Falcon has strategic and operational oversight of news programming and production across Univision Networks, Univision Television Group and Univision Interactive Media, as well as all sports programming and production. “Alina’s track record of success leading the Univision Network, as well as her strong industry relationships and deep roots in the news business, make her the ideal person to take the helm of this new division and seize opportunities for growth and expansion,” Conde says. Recent examples of this commitment to public service include an aggressive multi-media campaign to raise awareness of the transition to digital television (DTV), which included dedicated DTV specials, more than 70,000 DTV educational public service announcements, coverage through national and local news, a comprehensive mini-site on Univision.com, and integration in the network’s top programming, including the Latin Grammy Awards. During the H1N1 virus outbreak, Univision worked closely with government and health organizations to ensure that Spanish-language resources were available as part of the Salud es Vida ¡Enterate! campaign. Univision also created a one-stop-source of information on the company’s website and included informational segments on H1N1 in on-air programming. Most recently, Univision announced a multi-million-dollar, three-year initiative called Es El Momento, aiming to improve academic achievement among K-12 Hispanic students with a specific focus on increasing rates of high school graduation, college readiness, college completion and engaging Hispanic parents. “Univision has the unique ability to foster trust, bring together experts and companies and coalesce such powers around a huge issue,” Conde says. Es El Momento will cross all platforms—television, radio, online and mobile—and will be conducted in collaboration with the Bill and Melinda Gates Foundation, the U.S. Department of Education, and Latino organizations from across the country. 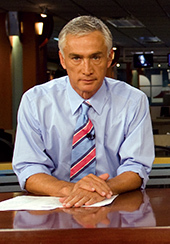 Award-winning Univision news anchor Jorge Ramos serves as the campaign’s primary spokesperson. The campaign focuses on fostering a strong culture of academic achievement and college aspiration among the U.S. Hispanic community. Outreach efforts will target Hispanic students, their parents, and the broader community through public service announcements, special programming, and grassroots partnerships. Es El Momento will also extend to online and mobile platforms. While Univision’s campaign is working to raise expectations for an entire generation, the company’s own next generation is hard at work moving the company comfortably and deftly into the future—whatever it may hold. What it means for the average viewer is consistent quality across platforms, diverse content and multiple touch points (like mobile information) they haven’t had before, Conde says. So whether Spanish-language programming in the future lives on a TV screen or a cellphone, Univision—and the community it serves—will be ready. By Diana Terry-Azios is a freelance writer based in New York.